This guest post is by Karen Heard-Lauréote, Reader in European Politics at the University of Portsmouth. My STEM-based colleagues are always going out to “feeder” schools and blowing stuff up (in contained experiments of course), conducting maths magic and playing with Meccano to design crazy structures in an effort to encourage pupils (especially) girls to consider studying one of their subjects at University. And there’s a lot of money sloshing around in the STEM subject promotion kitty to do this. In the humanities and social sciences we have far-less spectacular tricks up our sleeve to boost interest amongst school pupils in our disciplines and engage them to aspire to apply for one of our courses. Let’s be honest – taster lectures are about as innovative as it sometimes gets when us political scientists do school outreach. 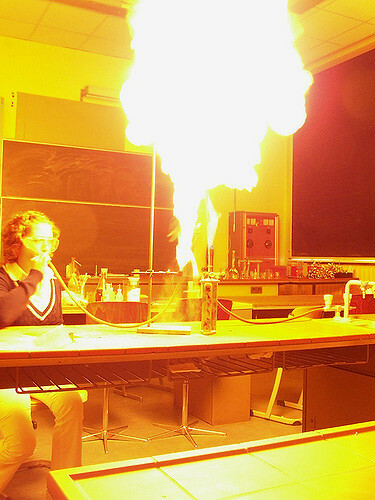 In a climate of decline in humanities and social sciences recruitment and funding, and in a context of widening participation in HE, the time has perhaps come to join our STEM colleagues and put a few fireworks into our own outreach activities. And so as a keen advocate of active learning in my university-based UG and PG-level pedagogy I thought about using EU political decision-making simulations as an outreach tool in schools. School funding for careers activities and support has hugely reduced in recent years and it turns out that schools are only too willing to get local HE providers in to do such activities – particularly in the last week of term when the teaching staff are exhausted! The idea is simple. We developed a crisis-meeting scenario which had sufficient verisimilitude to a real phenomenon (in our case the Calais refugee crisis) but reduced the complexity of the decision-making process and took some liberties with the “facts” to make the scenario manageable to simulate in 3 hours and as close to the pupils’ own experience as possible (swapping Calais with Cherbourg, which has a direct ferry route to Portsmouth). We developed role cards with actors ranging from the CEO of Brittany Ferries, local Council and City leaders, local MPs and local NGO and business groups and went into the school a week before the simulation to assign roles and instruct pupils on how to prepare. A week later we came back and ran the simulation. We saw pupils fully assimilate and inhabit their roles – a few so retrenched in the arguments of their character that they surprised both themselves and their teachers with their enthusiasm for negotiation, problem-solving, diplomacy and use of political rhetoric to persuade others. Political science as a field of study that may have previously been perceived by school pupils as abstract, dry and serious, suddenly came alive, attractive and exciting in the context of the simulation. So apart from being a great deal of fun, what does this kind of activity tell us about active learning? The results of a pre- and post-event pupil questionnaire showed us three main effects of simulations used in this context. First, the simulations increased the participants’ interest in pursuing university degrees in fields cognate to EU politics. As such simulations boosted interest in pupils in studying social sciences at University thus raising aspirations and most interestingly, it boosted, more specifically, their interest in studying political science and IR (where many of them placed European politics – but that’s another debate) as University subjects. Second, the simulations increased the participants’ self-assessed knowledge of EU politics. Third, the simulations increased the importance participants placed on understanding the workings of the EU. Taken together, these findings support our claim that EU-related simulations may be used as outreach tools to increase interest in pursuing EU-related subjects at university level. We may not have safety goggles, Bunsen burners, medical instruments, Meccano sets and the other paraphernalia associated with STEM subjects in humanities and social sciences to wow and amaze school children, but we do have powerful ideas and debates which, with a little nurturing of contacts in schools, we can explore in a fun way through the use of active learning techniques. Simulations as an outreach tool to boost general interest in HE participation and specific Interest in European politics could be worth a try. Puts me in mind of Yascha Mounk’s article in the Guardian https://www.theguardian.com/commentisfree/2018/mar/04/shock-system-liberal-democracy-populism; a good vehicle for “revitalising democracy”. Not just for content/process but that active learning embodies democratic values.